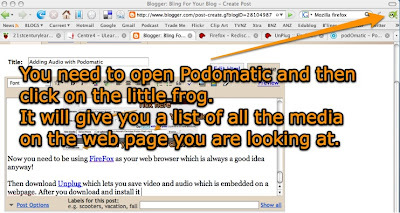 I found this way of adding audio simpler than using FileDen as I already have a Podomatic podcast page but you may need to create one if you haven't already. 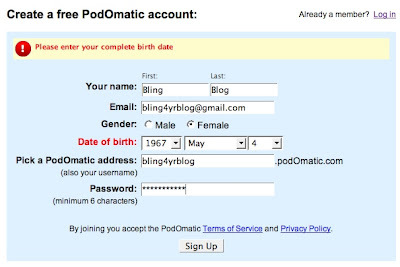 Making a podcast page is way easier than registering with FileDen. Firstly go to Podomatic and register. Choose a photo that typifies your look! Click where it says to post your first audio file. Fill out all the fields appropriately. 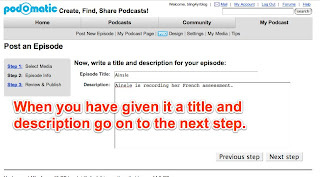 Now give your podcast a title and desciption so people know what it's about. I also like to tell people how long it is and how large a download it might be. My upper limit is 20MB- OK for broadband without taking too long. Then add a photo that typifies what your podcast is about. 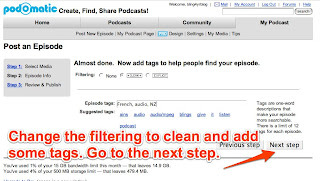 Change the filtering to CLEAN and add some tags to help people find your podcast. Lastly post your episode. 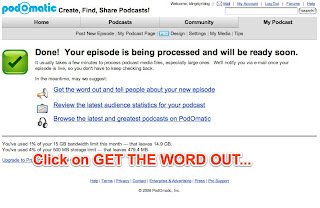 Wait for a bit and Podomatic will format your podcast and you will be able to listen to it. 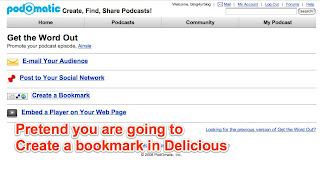 Pretend that you are going to create a bookmark for your podcast so you can get the URL for it. 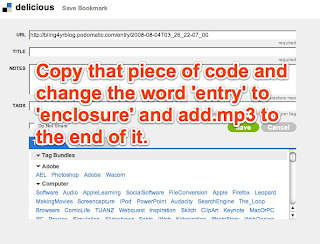 Copy the URL that Delicious gives you and change the word 'entry' to 'enclosure' and put .mp3 at the end then copy the whole URL. Now surround that URL with the following bit of code and put it in the EDIT HTML part of your blog post, publish it and it will play directly into your blog. Plan B: Now you need to be using FireFox as your web browser which is always a good idea anyway! Then download Unplug which lets you save video and audio which is embedded on a webpage. After you download and install it open your podcast page and then click on the wee fish. Here is your media list from Podomatic. Right click on the link and COPY THE LINK LOCATION. Now carefully insert the link location into this bit of code and publish your post. To make it easier for you to copy the code I have linked a pdf to this page so you can just open it and copy the text into your blog and change the link location. PDF with the html code on it. Your audio will look like this.. 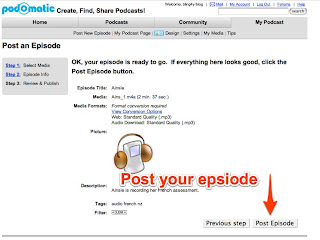 If you are publishing a video podcast you need to change the size of the object to 300x400. Beware though that I can only get this technique to work with .mp3 and .mov files not enhanced podcasts made in Garageband. 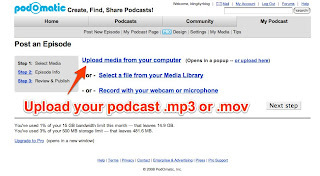 To share your enhanced podcasts made in Garageband you need to send them to iTunes and go ADVANCED - Convert selection to MP3 and upload that to Podomatic. If anyone out there knows of a way to embed .m4a or .m4v files I would love to know!! It would be great if you could share your successful adding of audio comments through the blog comments. After all that I decided to make a little video that will show you how to do if you are stuck. I see that Podomatic has changed its look a little so I will have to redo this section when I get a minute. You are my guru! I missed out on getting in to your 'Bling your Blog' workshop at ULearn (which I was gutted about by the way) but managed to get into the Podcasting one so are looking forward to it. I'm presenting in Breakout 2 so will be a busy but exciting week. Thanks so much for you help, I hope to have audio up on my blog by tonight with your tips. By the way, if you're on Twitter, and you'ld like to know the Exact Statistics of people that are clicking on the url link in your tweeks, visit my blog for a video which explains how you can have this capability. You'll even see statistics for each tweet to see which ones get you the most clicks!! FOR FREE! I have made a test site for an upcoming project about poetry. I used podomatic to create the audio and then posted the code to blogger but when we look at it on other browswers it wont show. the post will show but not the actual podomatic podcast. any suggestions? http://poetrytestsite.blogspot.com/ is the blog with the file embedded. thanks in advance.